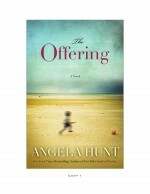 The Offering by Angela Hunt is a haunting and vivid picture of the unseen pitfalls modern medicine routinely digs as they reap what may seem to be a miracle. Mandy Lisandra wants a lot of kids. She was an only child whose father died when she was a child. Her husband’s extended Cuban-American family has folded her into their hearts. Mandy and Gideon have one daughter but have postponed enlarging their family until they stand on firmer financial ground and Gideon’s time in the military is completed. A chance conversation with another military wife alerts Mandy’s interest in gestational surrogacy. Pregnancy was easy for Mandy the first time, so she figures it’s a great way to give someone the gift of a child that would be biologically theirs. She’ll provide the “oven” to bake their “bun,” and add to her and Gideon’s bank account at the same time. I’m hesitant to share too much more of the plot. One of the reviews I read on Amazon said the back cover copy gave away too much of the plot and I have to agree I had several of those “when is that going to happen?” moments as I read. The Offering is a novel in the style of Jodi Picoult: a thought-provoking what if that is thoroughly rooted in reality and could really happen. Modern medicine enable us to do many things unbelievable even a generation ago. The Offering has the courage to ask if just because we can do something, does that mean we should do it? You may not agree with Mandy’s decision at the end, but I believe she made not only the right choice but the best decision for herself and her family.